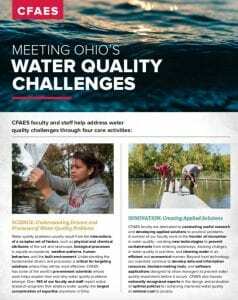 What is CFAES doing on behalf of Ohio’s water quality? A lot. Our efforts fall under four core activities: science, innovation, education, and collaboration/extension. Just what does that mean? A colorful, quick-to-read fact sheet explains. Posted by Kurt Knebusch at 3:27pm Posted in At Home, In Business, On Campus, On The Farm and tagged water, water quality. Bookmark the permalink.